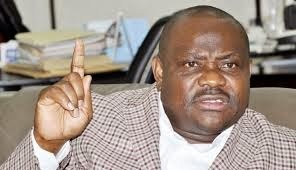 Rivers state governor-elect Nyesom Wike has vowed to dissolve the 22 council chairmen who were sworn in yesterday by the outgoing governor, Chibuike Rotimi Amaechi, adding that, his action would be supported by Muhammadu Buhari, Nigeria’s president-elect. Wike stated this during a pre-inauguration lecture held on his behalf at Astec Event centre, Port Harcourt, arguing that the election that brought the council chairmen and councillors was done out of impunity because the court stopped it but the outgoing governor went ahead with the election. “The outgoing Governor charged the council chairmen while swearing them in to resist any attempt to dissolve them because Buhari would not support impunity. Who is master of impunity when the court said don’t organise any election because it is illegal and you went ahead. If I dissolve them, Buhari would support me because that is the height of impunity,” Wike said. He accused Amaechi’s administration of spending over four billion naira in conducting an illegal election at a time that workers were owed salaries. Wike also alleged that there has been a last minute looting in the state. He cited example of Greater Port Harcourt Authority where he alleged that over N6 billion naira was paid in the last few day to Consultants. Wike stated that at a time that the state is indebted, the outgoing Governor was clearing all the government accounts. Amaechi has however assured that his administration would do everything possible to pay workers salary for the month of April, condemning the spate of protests by workers in the state over unpaid salaries.